This week of pregnancy has been quite eventful really. We had our scan on Tuesday to find out whether the baby was still breech, and got a little bit more than we bargained for as the powers that be decided that, despite a normal growth scan at 34 weeks, the baby is still measuring small, meaning that they want to get her out early. So we’re having a caesarean at 38 weeks. My posts might go out of sync a bit, as I always write them retrospectively (I am 37 weeks pregnant today, writing my 36 week pregnancy diary) so the next pregnancy update from me may well be our birth announcement! It depends on what happens this week and next weekend! Anyway, I won’t rehash too much about Tuesday’s scan, as you can read about that here if you like. On Thursday, I saw my nephrologist (kidney consultant). We had a very interesting chat in light of the scan on Tuesday and the decision to have a caesarean. I told him that we did have the option to try turning the baby (an ECV) but that we’d decided that there was probably a reason the baby had been breech since the 28 week scan. Interestingly, he said that he thought we were wise to take that decision as trying to manually turn the baby could potentially result in one of the cysts on my kidneys being ruptured. This would not be fun. I’m quite relieved that we’d decided against this anyway, but really it was just luck that we hadn’t chosen an ECV and I’d seen him before any action was taken. This is what I meant at the beginning of my pregnancy about him being involved in my care. It’s all very well saying that obstetrics will inform him if there’s anything to worry about with my bloods/urine but specialist practical knowledge like that about my kidneys and the ECV isn’t something obstetrics would know, or be expected to know about. I also asked if the size of my kidneys and lack of space inside me could have contributed to the baby being breech. 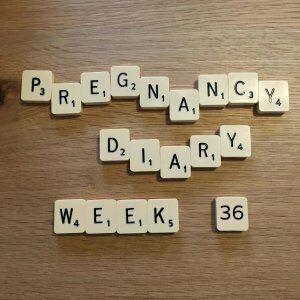 He said that without an MRI he couldn’t say for certain, but it wouldn’t surprise him if my huge kidneys were creating a kind of ‘buffer’ on either side of my uterus, effectively wedging the baby in place. This made me feel more positive about having a caesarean as I don’t feel that there’s anything I’ve done ‘wrong’ or anything more I could have done to try to turn the baby. Although the way she’s been moving this week I’m sure she’s been trying to turn, bless her. Except for Thursday. On Thursday she was really quiet. To the point that I called delivery suite and we went in for monitoring. Fortunately everything was fine and she started having a party in there as soon as I was hooked up to the monitor. The midwives at the hospital were great though, and even though they were super busy (I later found out from a friend that they delivered 11 babies that night!) they made me feel like a priority and I didn’t feel like I had wasted anybody’s time. I had wondered whether I had done the right thing as it’s difficult to know what constitutes reduced movements when baby has quiet days and busy days. But I was told on Tuesday to call even if I thought I was being paranoid, and I’m not at all sorry that I did, and wouldn’t hesitate to call again if it happened again. This coming week is going to be a busy one as we get final bits and pieces sorted out ready for baby. It’s a bit strange having an actual date but in a way it’s good as it gives us something to focus on. We’re used to working to a deadline so it works for us! "Meet the Parents – Advice for New Mummies and Daddies with Mummy Adventure"